ASX 200 up 30 to 6298 after early falls. China moves drive turnaround to touch near 10-year high. High 6314 Low 6258. Fails to hold 6300 again. Banks and MFG lead the charge. Miners join in as RIO goes Ex. Energy rebounds after early losses. Aussie Gold steady at $1632. Asian markets mixed as China bouncers hard as date for tariffs announced. CSI up 2.62% whilst Japan down 0.09%. CVN -drilling results from Phoenix helping. MFG +14.33% results and div payout cheers. Shorts squeezed. NCM +2.14% carrying value update. LYC +5.31% buying continues after Diggers and Dealers. PTM +2.91% catching the MFG updraught. AGL -4.09% runs out of gas. LOV -3.12% profit taking on broker move. QBE +0.98% follows SUN higher. STO -2.26% Beehive seismic program with MAY. FLC +8.05% South American contract. JIN +4.81% two big jackpots in a week. AJM +7.41% knocks back bid. TCL +0.42% agrees to hand over traffic data to ACCC. Speculative stock of the day: Canyon Resources (CAY) +36.00% after announcing the Government of Cameroon would grant CAY exploration permits to the Minim Martap poroject. Previous owners had identified a 550MT JORC resource of high grade , low impurity bauxite deposit. Biggest fallers – BAL, NGI, ECX, AGL, ORA and SYR. Suncorp (SUN) +4.74% FY18 result. Revenue down 11% to $15.45bn, net profit took a hit, down 1.5% to $1.06bn. The company will sell its life insurance business to Tal Dai-Ichi Life Australia for around $725m, 80% of the proceeds are expected to be returned to shareholders. The sale is expected to result in a non-cash loss in FY19 of $880m. Special dividend of 8c declared with a final dividend of 40c per share. Orora (ORA) –3.62% FY18 Result. Net profit up 12% to $208.6m, sales revenue up 5.2% to $4.04bn and earnings per share 11.5% higher to 17.4c. A final of 6.5c has been declared. Total dividend for the FY18 year is up 13.6% to 12.5c. Newcrest Mining (NCM) +2.14% Update ahead of its FY18 results. The miner now expects a hit to the values of several assets in the range of $260-270m. NCM cuts the value of Telfer by around US$190m and Namosi by around US$70m. BHP Billiton (BHP) +0.06% To settle a class action over the 2015 dam disaster at Samarco, the miner has agreed to pay US$50m with no admission of liability. AGL Energy (AGL) –4.09% Underlying Profit up 28% to $1.023bn towards the top end of guidance of up to $1.04bn affirmed in February. Revenue up 1.8% to $12.816bn. A Final dividend of 63c per share has been declared bringing the total dividend for the year to 117c, up 29%. AGL forecasts underlying profit after tax for FY19 to be between $970m-1,070m. Mirvac Group (MGR) –0.42% FY18 result. Total revenue down 7% to $2.802bn, net profit down 6% to $1.09bn, a final dividend was declared at 6c per share. Earnings per share were 15.6c, in line with guidance provided in June. MGR expects EPS to lift around 2-4% in FY19. Crown Resorts (CWN) +6.68% Statutory net profit down 70% to $559m after significant items, statutory revenue up 4.5% to $3.5bn and normalised net profit attributable to parent 13% higher to $387m. A final dividend of 30c per share has been declared. Australian VIP program turnover up 54.5% to $51.5bn. Magellan Financial (MFG) +14.33% FY18 result. Net profit up 8% to $211.8m, revenue up 34% to $452.6m and average funds under management up 29% to $59bn. A final dividend has been declared at 90c per share. Good result and generous with the payout ratio. The Reserve Bank of New Zealand left its key cash rate on hold at a record low 1.75%. Expect rates to be at these levels through 2019 and into 2020. CPI MoM +0.3% July PPI +0.1% MoM. 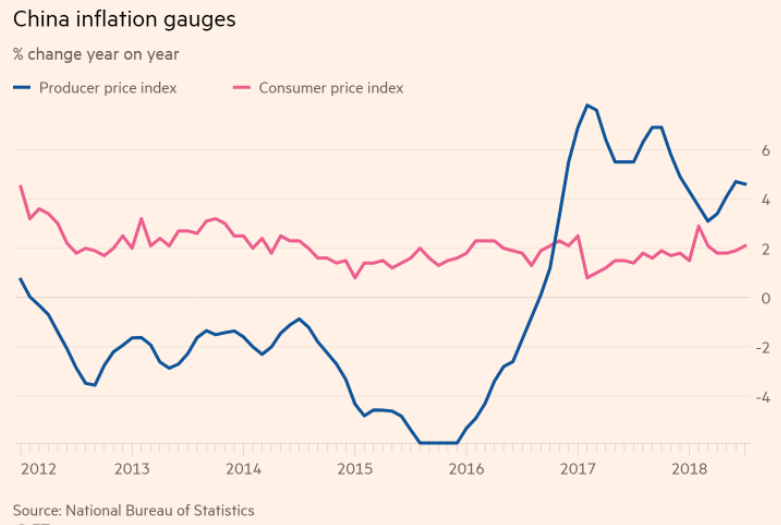 Philippines GDP misses expectations after inflation rise. Mazda, Suzuki and Yamaha admits conducting improper emission tests. 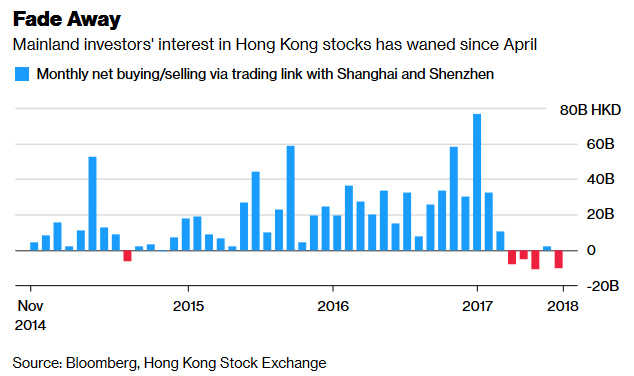 Chinese investors are turning sour on HK stocks. Net sales last week amounted to about HK$7.5 billion, the third biggest weekly total on record. Pressure on Musk to show me the money after Day three of the ‘tweet’. Musk in trouble with SEC over twitter work.